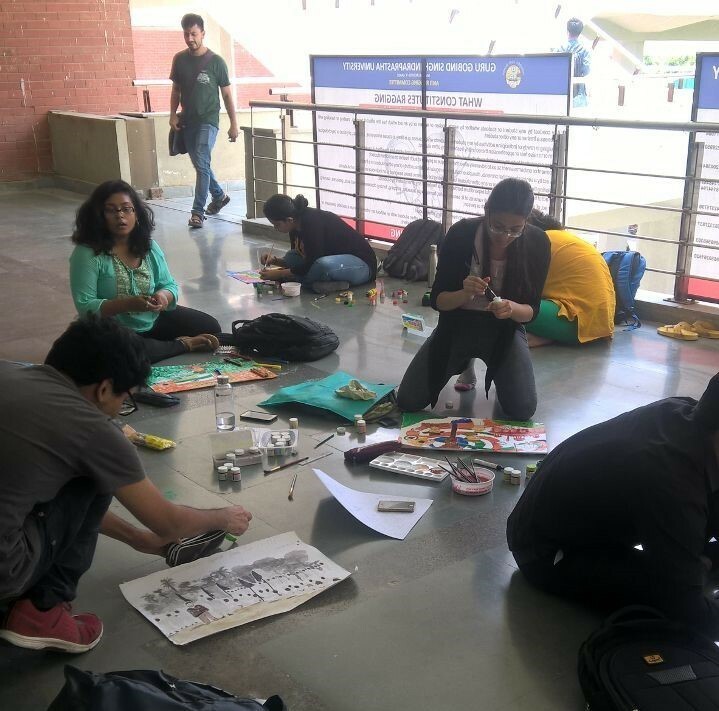 Lalitya, the fine arts club under the aegis of Srijan, organized a Painting Competition as a part of the University event ‘Azaadi 70’ on 22nd August, 2016. Thirteen students from various University Schools participated in this event with great vigor and enthusiasm. The topic for the painting competition was India’s Independence struggle. In the two hour prescribed time limit for the competition, the A3 sized sheets provided to the students were beautifully painted on with the colours of the Indian flag, portraits of Indian freedom fighters and other symbols representing Indian culture. Dr. Deepshika Aggarwal, the faculty coordinator for the fine arts club was indispensable in her efforts in organizing and executing this whole event. At the culmination ceremony for the event ‘Azaadi 70’ later that day, a prize for the painting competition was awarded to one very talented student, Ms. Shipra Tyagi (USEM). The rest of the students were awarded a participation certificate each.